Are high street retailers doomed? We’re only two months into the New Year and established businesses such as Jessops, HMV and Republic have been claimed victims of administration – will high streets become ghost towns? The internet has had a profound effect on brick and mortar retailers. In fact, shoppers spent 12% more online in 2012 than the previous year whilst Britons are the biggest online shoppers in the developed world. But a retailer will always have the advantage of being able to purchase a product right there and then. It’s not about retailers competing with their own online stores; it’s about offering the customer something different. So how do you convince people to ditch their mouse and keyboard for the high street? By immersing them in an experience their PC screen can’t offer. Technology is slowly entering the retail environment and it’s bound to become more prominent in the very near future. I’ve picked several examples which showcase how the retail environment can become more interactive. If all else fails, there’s nothing like discounts to get people through the doors. Store cards and coupons are things of the past – the future lies with augmented reality. Do you think an interactive shopping experience can save retail stores? Tell me in the comments section below. Making predictions about the economy is notoriously difficult and a challenge that is best met by looking at all the sources – somewhere in the middle the truth might yet be glimpsed. Pensions Age where moderately upbeat about 2013, stating that 2012’s big storms of the Eurozone Crisis and the Chinese leadership transition will have died down considerable in 2013. They believe that low interest rates and anaemic growth will continue in 2013. They suggest “a strategy which favours higher quality stocks and is focused on enhancing yield through asset classes like high yield debt”. A rather sobering account of 2013 from moneyweek.com suggests nothing much will change. His belief is that we should look at the bigger picture, and for him that’s a ‘zombie’ like western economy with little movement in any direction. His more specific predictions are no country will leave the EU, the UK will lose its AAA rating and the Bank of England will own 40% of UK government debt. Over at economicsuk.com David Smith gives his mixed opinion of the global economic outlook. Much like Pensions Age David thinks that the woes of the Eurozone crisis and US Fiscal Cliff are for the most part behind us, yet he says we may not be out of the woods yet and both these spectres may come back to haunt us. Russell Investments give a reasonably positive outlook for the year ahead. They think we have a reasonably volatile year ahead mainly due to the tug-of-war between austerity and reflationary monetary policy in the Eurozone, yet despite this investors should see signs of a global recovery, mainly due to a continuation of US and Chinese growth. Much like many other commentaries Russell see that the low yield on bonds will force investors a little up the risk curve towards equities. Money Observer isn’t so sure that the Eurozone crisis is over citing that the southern countries are still on uncertain ground while the entire region is suffering lowered consumer demand due to austerity policies. The positives come in the form of global companies that are doing reasonably well and could benefit from a recovery in the US and a soft landing in China. The Telegraph asked a lot of experts to make predictions about key aspects of the economy. On equities vs. bonds HSBC and others agreed that there would be a gradual slow recovery in 2013 and with such a low yield on government bonds the case for equities is strong. Again chat of the Eurozone brings in mixed opinions the worst may be over – maybe. Tech companies particularly those in the cloud and mobile computing arenas may be worth a punt in 2013 according to HSBC strategists. The outlook for housing and saving is still grim with the consensus being there isn’t much to be gained in either investment options. This blog has been written on behalf of Russell Investments . The opinions expressed herein are not a statement of fact, are subject to change and, unless they relates to a specified investment, do not constitute the regulated activity of “advising on investments” for the purposes of the Financial Services and Markets Act 2000. This material does not constitute an offer or invitation to anyone in any jurisdiction to invest in any Russell product or use any Russell services where such offer or invitation is not lawful, or in which the person making such offer or invitation is not qualified to do so, nor has it been prepared in connection with any such offer or invitation. For the first time the prospect of Great Britain leaving the European Union is on the table. Prime Minister David Cameron has promised a referendum after the next election. The promised referendum will only have one question – should Britain be in the EU or not? There is no question of other issues such as monetary union being discussed. Cameron has said that he will be campaigning to stay, but that he will also be seeking a ‘repatriation of powers’. There has been criticism of the decision to announce a possible referendum for creating uncertainty. The consequences of Britain possibly leaving are at present unknown, however critics of the referendum plan say that uncertainty could discourage investment in Britain and delay economic recovery. One of the consequences of uncertainty over Britain’s future in the EU could be an increase in the cost of government borrowing. This would be as a result of the bond market reacting negatively. A recent poll found that a clear majority of British voters would vote to leave the European Union. The referendum would happen in 2017, but if it were to happen now 34% would definitely ask to leave, along with a further 22% who probably would. The total amount who would definitely vote to remain is just 30%. Support for remaining in the EU is in short supply across supporters of all political parties. The most pro-European are the Liberal Democrats, however even four out of ten amongst them would vote to leave. By promising a referendum despite thinking Britain should stay, it is possible Cameron is hoping for an electoral boost due to the popularity of this policy with both Conservative and Labour supporters, and to neutralise the threat posed by UKIP. A lot could change by 2017, with both the ‘in’ and the ‘out’ camps having a chance to argue the case. The benefits of EU membership are likely to get more coverage as part of this discussion, as well as the possible risks and benefits of leaving. Do you think Great Britain should leave the EU? Please feel free to share your thoughts in the comments below. In some more bad news for the banking industry on the Emerald Isle, Ulster Bank have announced they are to close around 20 (correction – the number is now 22) branches/sub-offices island wide. As the 3rd largest bank in Ireland, Ulster Bank currently operate 146 branches south of the border and 90 in Northern Ireland. The decision has come as part of the company’s recent review of their branch network. The Irish Bank Officials’ Association has indicated that the ROI and NI will see roughly half of the closures each. In 2011, the bank was forced to write off £1bn in bad loans, mostly involving property. Last January it announced plans to shed 950 jobs over the course of 2012 – 350 in Northern Ireland and 600 in the Republic. However, the high profile IT problems experienced in the summer caused the redundancy plans to be delayed. Ulster Bank did stress that they have no further plans for redundancies beyond the 950 announced last year. “We continue to keep our branch network under review to ensure that we are operating in the correct locations for our customers,” said a statement from the bank. Ulster Bank is likely very keen to see many customers begin using internet and mobile banking in the UK and Ireland. In November the National Irish Bank closed all of its branches and rebranded to Danske Bank (the name of its Danish owners), switching entirely to servicing customers via post offices, internet banking and phone banking. Over the course of 2012 several other major banks announced branch closures on the island. In July TSB Permanent announced it was planning to close 19 of its 92 branches with around 250 job losses. Allied Irish Banks has already closed 51 of its 267 branches with another 16 set to close over the coming months. This all comes on top of a raft of closures of small banks which folded during the financial crisis. It looks like many Irish customers will have to get used to the idea of either doing their banking at the post office or using phone or internet banking. Are you planning to start doing your banking online or over the phone? If so feel free to let us know your feelings about it. Belturbet (Co Cavan), Castlepollard (Co Westmeath); Glenamaddy (Co Galway), Killeshandra (Co Cavan) and Kilnaleck (Co Cavan), together with the following sub-offices: Carrigallen (Co Cavan), Delvin (Co Westmeath), Kilcormac (Co Offaly), Kilkelly (Co Mayo), Rathangan (Co Kildare) and Swanlinbar (Co Cavan). Carryduff near Belfast, Dromore in Co. Tyrone, Harryville near Ballymena, Jordanstown near Belfast, Knock near Belfast, Longstone Street in Lisburn, and Shaftesbury Square in Belfast City; together with the following sub-offices: Ardglass in Co. Down, Moy in Co Armagh. Rosslea in Co. Fermanagh and Saintfield in Co Down. Recent reports from the Guardian state that house prices in the UK remained at the same level throughout 2012. It is also predicted that there won’t be much change in 2013. One change however, is that home buyers should find it much easier to be approved for a mortgage this year, as many banks reportedly plan to increase their loan availability. Buying a house is one of the biggest purchases in life and asking the right questions can save you a lot of money in the future. Read on to discover what essential information you’ll need before making this important decision. What’s the real cost of buying? Choosing the right mortgage is extremely important. Ask your bank if they offer any competitive deals if you pay a bigger deposit. Choose your saving account wisely to maximise interest, as saving for a little bit longer will pay off in the future in lower interest. Calculate the real cost of buying a house by taking some other fees into consideration. Many mortgage providers will ask you to pay an arrangement fee which can cost you up to £1,000. Your lender will also charge you the valuation fee. The total cost will also be influenced by the legal fee or any surveys you decide to undertake. Think ahead about gas and electricity prices, getting the best tariff and possible wall and loft insulation. Remember to put aside some cash for any emergency DIY works the house might require, and don’t forget that it also needs to be furnished once you move in. After finding the right property and making an offer, it could take several months before the whole transaction is complete and the property is legally yours. It is however advised that you take as much time as possible to make this important decision. Make sure you research the neighbourhood, check what people say about it on the Internet, or how far the nearest school is. To get a real feel of the area, visit at different times of day, have a look at local pubs and shops and consider staying in a local B&B for a night. Say hello to your closest neighbours and ask what they like about living in the area. It will also give you a chance to get an impression of who they are and how well they maintain their house. If you particularly like an area, it may be worth writing a letter to explain that you’re looking to buy in the neighbourhood. Someone considering selling their house might contact you and it will not only help get ahead of others, but will also saving you on the agency fee. Going from one viewing to another can be both exciting and exhausting, but it’s important you think about some of the obvious things to avoid when buying a house. Taking a house survey can cost you a lot of money and often it’s not necessary, especially when you have a closer look. Start by searching for any signs of mould on the walls and inside the cupboards. Look around for cracks or any stains on walls. Open and then close all the doors and windows and check if they are draft proof, as you might feel it on your energy bill. Check if the heating works properly and inspect the plumbing, as well as the outside of the building, including the roof. And the last thing… check if your phone has a signal. What other advice would you give to a first time buyer? Now in its 19th year, the Ulster Bank Business Achievers Awards has become one of the most highly anticipated events in Ireland’s business calendar. Earlier this month, the bank started taking entries for the 2012 awards. The awards recognise the business successes of companies from all over Ireland irrespective of their offering, size or sector. Last year over 350 businesses entered the awards hoping to possibly come out as provincial or even national winners in their respective categories. The awards from Ulster Bank’s business division are particularly popular among start-ups. The chance to get some PR coverage from the media partners of the awards, the Belfast Telegraph and the Irish Independent, have proved major draws for publicity hungry young businesses. Last year medical device manufacturers TG Eakin scooped the top prize of Overall Business Achievers Award Winner 2011. A €50,000 publishing bursary with the Irish Independent. Business mentoring from Enterprise Ireland. A full service communications workshop given by leading PR, Marketing, Sales and Communications specialists. For this year’s awards Ulster Bank has made some significant changes. Two new categories have been added: Woman Led Business and Best Established SME. Also the Agriculture, Food and Drink categories has been split into two separate awards. The awards are run with the support of a variety of influential organisations including: The Prince’s Trust, InterTradeIreland, Enterprise Ireland, the Irish Independent, Invest Northern Ireland, the Belfast Telegraph and Small Business Can. Ulster Bank will be accepting entries to the 2012 awards until 28th February 2012. If you want more information or are looking to enter the awards go to the official Business Achievers Award site. Have you or are you planning to enter the awards this year? If so we’d love to hear about your business, just leave a comment below. It is the time of year when people in America go a little loopy with their shopping habits and see no problem with queuing overnight to make sure that they get the best deals possible heading into the festive period. Black Friday has already taken place and it looks like it was an interesting year for the super sales. Overall there were more shoppers taking to the streets and malls than last year. A report produced by ShopperTrak showed that foot traffic climbed by 3.5% when compared to last year to more than 307 million people. But overall sales from this year dropped by 1.8% to $11.2 billion. Many people feel that the longer opening hours and the fact that Black Friday is continuing to cut into Thanksgiving will be affecting the way in which people are shopping and how they view the entire Black Friday weekend. 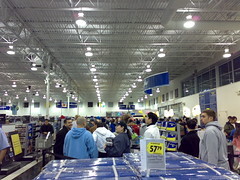 As you may have seen the queues and general stampeding at Black Friday events are unlike anything else. This is perhaps why many people decide to skip the pushing and fighting of heading to malls and choose to do their shopping online. Online sales have soared with many companies releasing deals before Black Friday. Sales increases of around 17% on last year were reported for Thanksgiving and nearing 21% for Black Friday. It is believed that the volume of online traffic will fall back to regular pre-holiday levels. This highlights the shift over this holiday period that Black Friday deals are no longer just for stores and Cyber Monday deals are not just for the single Monday. We will have to wait and see what the overall growth is for this years holiday period as although people are being given more hours to shop they don’t have more people to buy gifts for and they don’t have more money to spend on goods. It could be seen as a good sign for the economy as the consumers did spend money but it is not a direct representation of the economy as a whole. Were you involved in the Black Friday sales? Do you think that the Black Friday sales are taking away from the ideals of Thanksgiving? Please leave any thoughts or comments in the comments section below. There will be a referendum on Scottish independence in 2014. This is actually earlier than Scottish nationalists had wanted, the reason for this being that polling is indicating that the vote would not be successful for them and that they would have liked more time to make the case for independence. Certainly there are some questions that remain to be answered.